What is it with kids and chicken nuggets? I know that my kids love them. Yuck. Not sure the last time I ate a chicken nugget but my guess is that mullets were in style at the time. Hence, the picture below…. My kids like things that they think are junky or anything with a batter that appears to be fried. Hopefully this is a score with the crispy coating. 1) Preheat the oven to 350°F. 2) Unwrap the tofu and shake off any excess moisture. Place the tofu in a freezer bag or wrap well in plastic, then freeze the sealed tofu for at least 24 hours. The next day, thaw the tofu by placing it—unwrapped—into a microwave-safe bowl. frozen tofu. scary looking, I know. Cover the bowl and microwave on high to defrost, checking every 2 to 3 minutes to make sure the tofu doesn’t cook. Once thoroughly defrosted, gently squeeze out any excess moisture. Cut into 1-inch cubes. 3) In a shallow bowl, add the bread crumbs and spices, mixing well. 4) In a separate bowl, pour 1/2 cup of water. 5) Dip each piece of tofu first into the water, lightly shake off any excess water, and then roll into the seasoned bread crumbs. 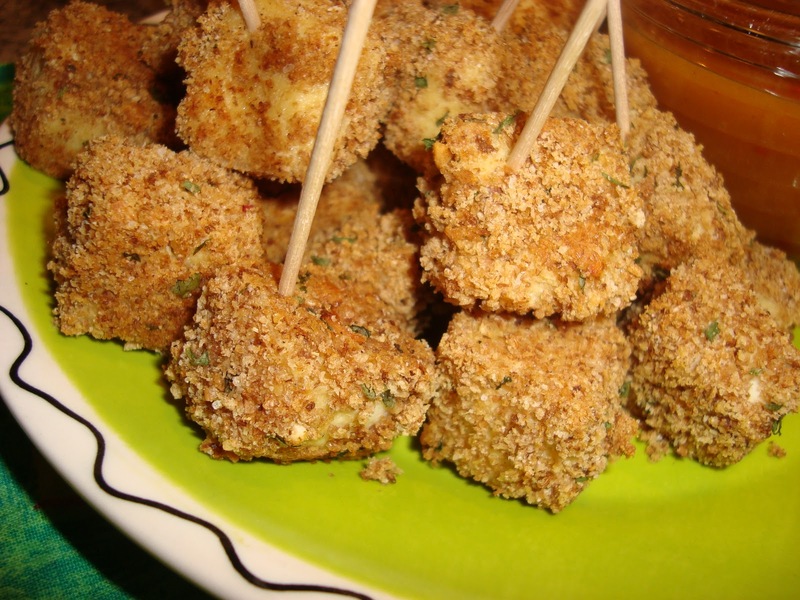 6) Put the breaded tofu cubes on a lightly sprayed baking pan and bake 30 minutes, or until golden brown and crisp. 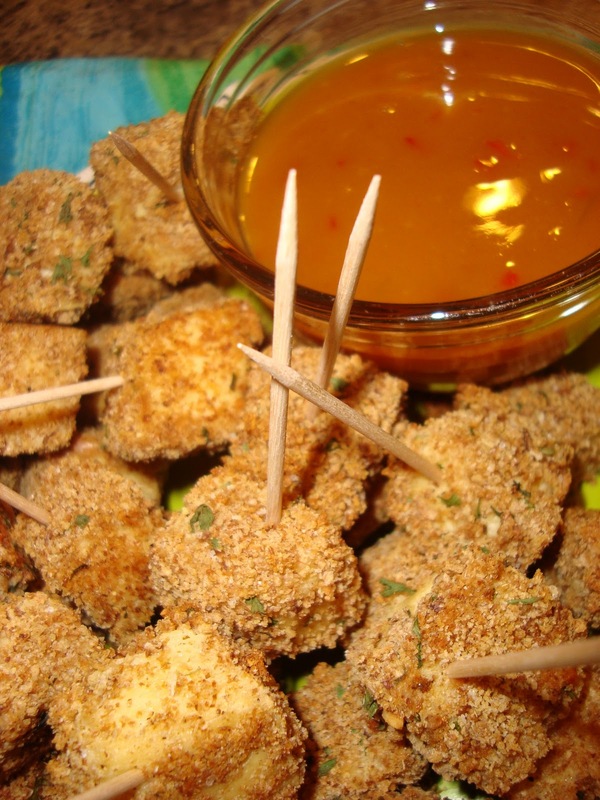 7) Serve with a dipping sauce. I used a mango Caribbean sauce. Thought about doing straight ketchup for dipping. Boring. Although they do not taste like chicken nuggets (thank god), they were really good. As I mentioned, the crunch factor pretty much guarantees that they will be acceptable fare in this household. Everyone ate and dipped, especially dear Devyn who polished off the final crumbs. Rutabaga: It’s what for dinner. So the question of the household at the witching hour is always “What’s for dinner????? ?” (insert whine-y voice) Some nights I hate that question because I know that they will hate my response. Other nights, I say bring it on! Tonight it was on. Especially because I answered: Rutabaga Casserole. 8 year old boy: “What the heck is a rutabaga?” (typical turned up nose) Which I expected. New recipe+Not pizza=Dirty look from kids. BUT, the kids were asked forced to keep an open mind because that is one of my expectations. The verdict? We loved it and thought it was fantastic. Little background on Rutabaga: it is a root vegetable. Sort of a hybrid of cabbage and turnip. Less calories and carbs than potatoes (for those who still count) yet still a great source of vitamin C and fiber. 1) Preheat the oven to 375 degrees F.
2) Prepare the cashew cream first. In a small bowl, pour the boiling water over the cashews and let sit for between 20-30 minutes. Stir in the nutritional yeast. *** If you are unfamiliar with nutritional yeast, get familiar! This is a nutrient dense, flaky, cheesey-flavored staple in my household. Because I am a vegetarian, this requires an extra effort to maintain Vitamin B-12 levels (normally found in meat and other animal based foods). Not only does nutritional yeast provide Vitamin B-12, it also has 6 grams of protein and 3 grams of fiber per serving. Needless to say, the stuff gets put on everything on our house! ….until the consistency is smooth and creamy. Season with salt to taste. Set aside. 3) Mix all herbs together in a small bowl. 6) Cover the bottom of a mid-sized baking dish with a single layer of rutabaga slices, overlapping their edges and working in a circle. Sprinkle with herbs. Add another layer and season with herb mix. Pour in about one third of the cashew cream – enough to cover these two layers. Continue until the baking dish is full or you run out of rutabaga. Pour in the remaining cashew cream, almost to the rim of the baking dish. 5) Sprinkle with Panko bread crumbs until covered. Drizzle with a generous dose of olive oil. Place in the oven. Bake for 45 to 55 minutes, until rutabagas are just cooked through and bread crumbs are toasty and brown. Serve immediately. Yum. My kids approved. As a matter of fact, they used spoons for final scooping. That’s a good sign. Super simple. With an entire can of beans for protein, this has nothing to feel bad about, other than potential garlic breath. 1 can cannellini beans (basically white kidney beans), rinse and drain the goop. yuck! In a medium bowl, mash the beans with a hand-held potato masher. Stir in the next 6 ingredients. Season to taste with the salt and pepper. Serve with cold veggies for a winning combination. It might not be pretty, but it more than makes up for it in flavor.